By now we all know that Justin Trudeau is a fan of a good photo-op. Last week he made headlines after he ran passed a group of students headed to prom in Vancouver. Then he stopped to take a very epic group photo with them. This week, Trudeau was back in Ottawa and he spent some time with five-year-old Bella from Manitoba. 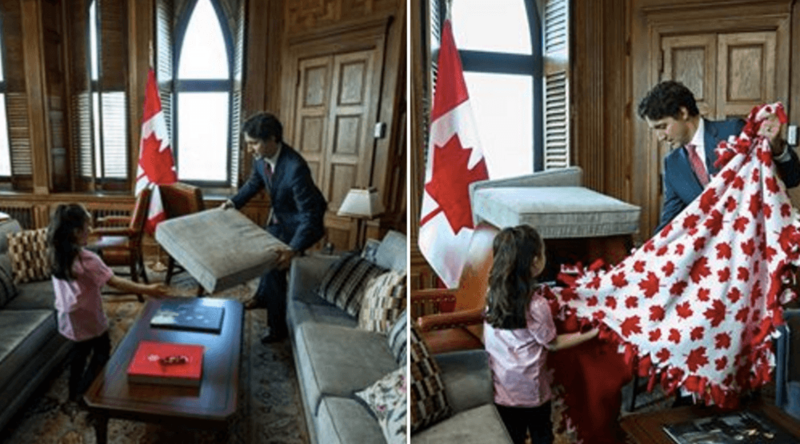 Bella was the winner of CBC Kids‘ contest to become “Prime Minister For a Day” and one of her requests was to build a pillow fort with Justin Trudeau. Of course, Trudeau agreed to hang out with Bella and they spend some time building a fort in her office for the day. Yeah, we know Trudeau like’s his photo-ops, but you can’t tell us this isn’t adorable.